In a remarkable twist of fate, a woman missing since she told loved ones she was going for a hike on Mt. Hood last Sunday has been found and is expected to be okay. 23-year-old Mary Owen was flown to a Portland hospital in an Army National Guard helicopter after she was spotted below the mountain's Sandy Glacier just after 10 a.m. Saturday. A Clackamas County Sheriff's Office spokesman said she was hoisted up into the chopper and was able to talk to her rescuers. Owen's family members tell FOX 12 she has a leg injury and frostbite, but doctors expect her to make a full recovery. "I don't know another person who could have survived that ordeal," said Mary's father, Bruce Owen. Dozens of responders showed up at the established staging area at Timberline Lodge early Saturday to resume the search effort that began yesterday. The George Fox University student was reported missing in Newberg last week. Newberg police contacted the Clackamas County Sheriff's Office on Thursday. The manager at Timberline Lodge checked the parking lot Thursday night and found a white 1998 Toyota 4-Runner, which Mary apparently borrowed from a friend to make the trip up. Deputies arrived and said it appeared the SUV had been sitting at that location for some time. Owen had sent an email to a friend that stated she was going hiking on the mountain. The email said she planned to be back that night or Monday morning, according to her father, Bruce Owen. Bruce Owen told FOX 12 his daughter survived by building a snow cave and keeping warm under a light-weight poncho. But after several days with little food and water, she started to hallucinate. "She kept imagining people would come to her and tell her ways to get off the mountain," said Bruce. "Like there was some little people who came to her and told her they were going to bring her a horse. Somebody else came and said she could use their dragon but they never came back." Bruce said his daughter caught a real glimmer of hope Friday, when she spotted a search plane overhead, but rescuers didn't see her on the ground. "She said that there were parts where she wished she could just die and have it over with," said Bruce. "But she came to the conclusion that God wasn't going to let her die. So she was just toughing it out one day at a time." Owen is a senior at George Fox University, where she was noted as a contact for groups who work with the homeless on the school's website. Her father posted to the university's Facebook page, was asking for prayer for his daughter's safe return. "We still need information on who she might have been with and ask anyone with ANY information to contact Newberg Police or message us through FB," he wrote. -Copyright 2013 by KPTV-KPDX Broadcasting Corporation. All Rights Reserved. 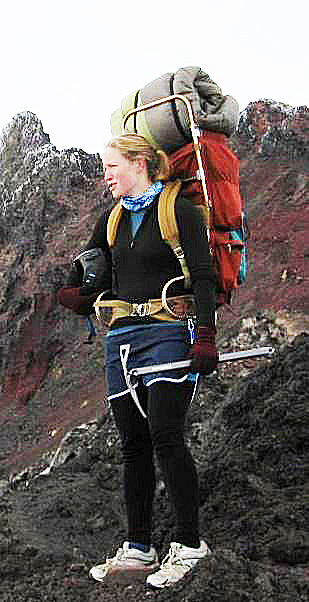 Mary-owen-in-packjpg-db9c39a202aa1471Moments after Bruce Owen arrived at Timberline Lodge on Saturday, he got the news that his daughter, who'd been alone and missing on Mount Hood since last Sunday, had been found. Her leg was injured and she had frostbite, a Clackamas County Sheriff's sergeant told him, but she was alive and in good spirits. Owen dropped to his knees and tears flowed. "I lost it," Owen said. "This is by far the most harrowing experience that we've gone through." On the way up to the mountain, Owen, his wife, son and two of his daughter's friends prayed that when they arrived his daughter would be found. "That's literally what happened," Owen said. Mary Owen, 23, was treated Saturday in the emergency room at Legacy Emanuel Medical Center, where a nurse said she was in serious condition. She was lost in white-out conditions near the summit late Sunday night, said Rachel Oliveri, one of Owen's three sisters. Descending, she hurt her leg in a fall and was unable to walk. A thermal poncho kept her warm at night, but she ran out of food on Wednesday. "We are so proud of her for her courage and stamina and for keeping her head while waiting for (rescuers) for so long," Oliveri said in an email. "I think she got really lucky given that we didn't know where to look," said Steve Rollins, rescue leader for Portland Mountain Rescue. Rollins planned to climb aboard an Oregon National Guard Black Hawk helicopter to look for her but he never got a chance. The crew set off on a flight test before taking searchers onboard. That's when they spotted someone who matched Owen's description, with black leggings, blue shorts and a black sweater, below Sandy Glacier at an elevation of 4,600 feet near the Pacific Crest Trail. About 10:30 a.m., they hoisted her to safety and flew directly to Emanuel. "It would have been too hard on her to walk her out," her father said. "She was so weak." "She hasn't eaten anything," he said. Owen, a senior in interdisciplinary studies at George Fox University, is an adventurous spirit. She once spent a summer in Papua New Guinea working with a missionary group. For five months in 2010, she hiked the Pacific Crest Trail from Mexico to Canada. And last year, she raised money for a Bible translation group at a race in Idaho that involved canoeing, rafting, running and climbing. She hoped to summit Mount Hood for the first time on spring break last week. She was excited about that," said Elijah Owen, 17, her only brother. But those plans fell through. On Sunday, Owen emailed a friend, saying she planned to hike around Mount Hood and would return by Monday. When she didn't show up, her friends figured she had decided to linger. "We thought that maybe she had found more hiking spots," said Izzy Freeman, one of Owen's roommates. By Wednesday, Freeman became worried. She called Owen's family who notified police. An official at Timberline Lodge found Owen's 1998 white Toyota 4-Runner in the lot. Inside, deputies retrieved a laptop and a backpack, which was empty. Her friends said she had another backpack and probably took a sleeping bag. But she was not known to hike with a tent. A search on Friday turned up nothing. Owen's family posted messages on Facebook, asking everyone to pray. Bruce Owen, who lives in McMinnville, said hundreds responded. But he was worried. He knew that the longer his daughter was in the wilderness alone, the less likely it would be to find her alive. The Clackamas County Sheriff's Office launched a massive effort on Saturday morning, with dozens of volunteers from Portland Mountain Rescue, Mountain Wave Search and Rescue, Pacific Northwest Search and Rescue, Eugene Mountain Rescue, Corvallis Mountain Rescue and Hood River Crag Rats. Conditions were clear and sunny but there was one problem: avalanche risk. In the heat of the day, snow melts, causing it to become heavy and unstable. "Water can percolate to lower levels through the snow pack and can hit a weak layer and lubricate it," Rollins said. "That's what causes avalanches." The other problem was Owen's location. She hadn't told anyone which trails she would take. She wasn't carrying a location beacon and did not have a working cell phone, her father said. The search area was huge. Rollins expected it to take days. He was also surprised she was in such good condition. It might not have turned out so well, he said. "It doesn't matter if you're climbing Mount Everest or Mount Hood or on a day hike in Washington Park." Rollins said, "You need to let somebody know where you are going when you will return." Bruce Owen doubts the experience will quell his daughter's zest for adventure. But he hopes she stops hiking alone. But most of all, he's thankful that she'll make a full recovery. "This is a great gift for Easter," he said. Posted on April 6, 2013. 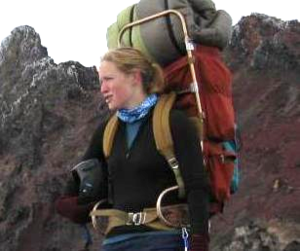 Posted in Faith, Local News, Media | Tagged Mary Owen, missing hiker, Mount Hood, Shelli Owen. Self-motivated reporter with enterprising news sense. Prolific writer familiar with numerous areas of journalism, including state and local news, entertainment, business, religion, sports and politics. Experienced in photography, page layout, graphic design, social media and Web management. Works well with others and in leadership roles. Mary Owen, equipped and dressed as she was found, including her shoes. The subject, a 23-year old woman who is a student at George Fox University, set out alone on Sunday March 24, 2013 at around 11:00 AM to climb Mt. Hood. She apparently did not leave a clear itinerary with friends who only knew that she might be spending a portion of her spring break hiking and climbing on Mt. Hood. She was wearing trail shoes and had only a plastic poncho for protection against wind and rain. She was not prepared to stay out over night. She ascended into deteriorating conditions above the Palmer lift, apparently became disoriented, and strayed far off course on the descent. She fell and hurt her leg that night and was unable to continue traveling the next day. She survived on snack food and water collected in her poncho until she was rescued on Saturday March 23, 2013..
Friends or family reported her missing on Thursday, March 28 and the Clackamas County Sherriff’s Office located her automobile in the Timberline Lodge parking lot that evening. The sheriff requested assistance from Portland Mountain Rescue the next morning, Friday, March 29. That day, a team of six PMR rescuers swept the Zig Zag Glacier below 8500 feet and cut for sign in Little Zig Zag Canyon and Sand Canyon. A team from Pacific NW Search and Rescue (PNWSAR) searched the Timberline Trail south and east to the White River Snopark. A fixed wing aircraft from the Hood River County Sherriff’s Office conducted an aerial search and spotted possible tracks on the Reid Glacier that could be searched the following day. Search efforts were suspended shortly after dark on the 29th. Four PMR rescuers were back in the field around 4:00 a.m. Saturday morning. A snow cat carried them to the top of the Palmer Lift. From there, they headed toward the summit to search the upper south side climbing routes. By 7:00 a.m., eight more PMR rescuers along with rescuers from the PNWSAR, Crag Rats, American Medical Response, US Air Force Parajumpers, Corvallis Mountain Rescue, and Eugene Mountain Rescue joined the search. Teams were dispatched to check the upper, lower and the western areas of White River Canyon, Illumination Saddle, terrain west of Mississippi Head down to Paradise Park and sections of the Timberline Trail. Around 9:00 a.m., an Air National Guard Blackhawk helicopter arrived. After a quick briefing, the helicopter headed directly to the Reid Glacier to investigate the tracks spotted on Friday. They followed the tracks down the mountain below tree line where they spotted the subject at around 4800 feet elevation (marked on the map below). They hoisted her into the helicopter and transported her to Legacy Emanuel Medical Center in Portland. In television interviews, the subject reported that she suffered frost bite to her feet and had deep lacerations on one leg. During this mission, the media reported that the Clackamas County Sheriff’s Office was unable to locate a climber’s registration form that the subject completed and filed in the climbers registry at the Timberline Day Lodge. Apparently, the US Forest Service Ranger responsible for the climber’s registry removed out-of-date forms (including the subject’s) from the file earlier in the week. Although climbers are asked to return to the registry to check out after their climb, few do. Therefore, the rangers assume that the many older registration forms that accumulate at the registry are for folks who made it home, but did not check in. These forms are filed for later compilation of statistics on mountain use. After this mission was over, the Forest Service located the subject’s registration. Also, the subject reported that she was surprised that no one started searching for her when she did not return at the time she estimated on her registration form. As posted in the climber’s registry, no one monitors these forms, and there is no system to identify overdue climbers or to trigger a rescue. All back country users should leave an itinerary with a responsible adult. This subject survived six nights in rough, snow-covered terrain. Fortunately, weather was unseasonably mild that week. PMR urges back country travelers to carry equipment appropriate for the conditions and their objective and to build appropriate skills before climbing in technical terrain. What can mountain climbers learn from this incident? Mary Owen is recovering at Legacy Emanuel Medical Center in Portland from injuries she suffered while lost for nearly a week in the snow on Mount Hood. The 23-year-old George Fox University student told The Oregonian that she hopes she doesn’t lose toes to frostbite. Owen had planned to climb the mountain with friends, but when those plans fell through March 24 she set out alone. She was caught in a whiteout near the summit, became lost on the way down and fell about 40 feet, injuring a leg. She made a hollow in the snow to wait for help. She melted snow in a water bottle and survived on snack bars, crackers and ramen noodles. She was spotted Saturday by an Oregon National Guard search helicopter. You're on a winter day hike when an unexpected blizzard develops. Visibility drops to nil, and you're forced to spend a night out in frigid temps. By morning, the storm has passed, but the stabbing pain in your feet has given way to stony numbness. Hike out to medical help immediately. If you suffer from frostbite–the formation of ice crystals between your skin cells–only one treatment will do: rapid thawing in a warm-water bath, administered by professionals. Don't attempt to thaw tissues yourself: Rubbing skin causes more cell damage, and exposing numb feet to a campfire can lead to serious burns. Until you reach help, it's actually crucial that your feet stay frozen. Once re-warmed, frostbitten areas become so painful and swollen that walking is impossible–and if thawed areas re-freeze, tissue death and amputation are all but certain. To keep feet from thawing as you walk out, adjust your layers so your body feels slightly cool. (Don't dress down so much that you risk hypothermia, of course.) Quickly improvise crutches if hiking is difficult. If you cannot keep feet completely frozen, remove socks or boot insoles to accommodate the swelling and continue walking out. Times have changed, each hiker should carry their cell phone! Ordinary cell phone coverage has improved, year by year, to the time of this writing in 2012 - see below for "The Rest of the Story". Check your own cell coverage in your favorite backcountry areas. Much of the high desert and the urban Wilderness now is covered by Verizon using CDMA code. The cell phones from other (urban) providers are not able to "see" CDMA towers and will not connect. Cell communication equipment used by many Providers services Mt. Hood. You should have good cell phone communications. If you are in a hollow or behind a ridge, just move a few feet! A fully charged cell phone signal from the right Provider can take the Search out of Search and Rescue. Each person in a group should carry their own simple ordinary personal cell phone. Solo hikers can carry a very inexpensive second cell phone battery. Some "smart phones" are sold with a second back up battery. Most of the cell phone batteries exhausted in search and rescues, are in so called Smart Phones. It seems that showing a map of the major trails, names and locations of prominent points, photos of views from points on the trail, keeping an electronic compass going, taking your photos and playing your tunes, while searching for better tower signals is more a phone battery can bear, no matter how smart the phone is. "Visitors are reminded to tell a Responsible Person where they are going, where they plan to park, when they will be back and to make sure that person understands that they are relied upon to call 911 at a certain time if the backcountry traveler has not returned. Call 911 as soon as you become lost or stranded. You will not be charged. Do not try to find your way, becoming benighted, exhausted, or worse yet - wet. Your ordinary cell phone call to 911 and conversation with SAR, can take the 'Search' out of Search and Rescue."